When creating an Asian culinary masterpiece, the right tools can make all the difference. You require knives dedicated to the precise task at hand. 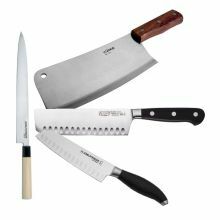 From razor sharp cleavers to separate meat from bone to narrow, thin, and pointed sashimi knives for intricate bladework, as well as Santoku and Nakiri knives, we carry a variety of Asian Cutlery.